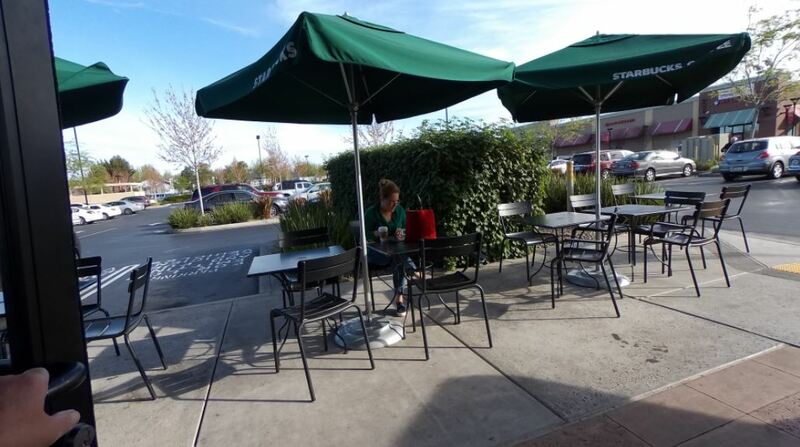 I have been using the Starbucks by Raley’s for meetings since selling AltamontCowork. Since I am familiar with that location, I chose it to be the first of many in this new series researching remote work locations in Tracy, CA. Note: My original blog researching WiFi “hotspots” was way back in 2007. WiFi was new back then and you had to pay for it. At the time, there were only three WiFi locations in all of Tracy, CA. Times sure have changed…. I plan to arrive between 9 and 9:30 AM at each of the locations. I will buy some coffee (black), then set up my laptop and Note 4 to the Internet (I need a mouse pad and mouse, so sufficient space is a concern) and do an Internet speed test. I will take notes on the vibe, note the furniture and tables, see where power is, measure the noise level with an app on the Note 4, hang out for a little while then pack up and leave. I will take pictures with the HTC RE before during and after. Lots of people sitting, or standing on line to get coffee. Muted conversations and an energy I rarely had at AltamontCowork. 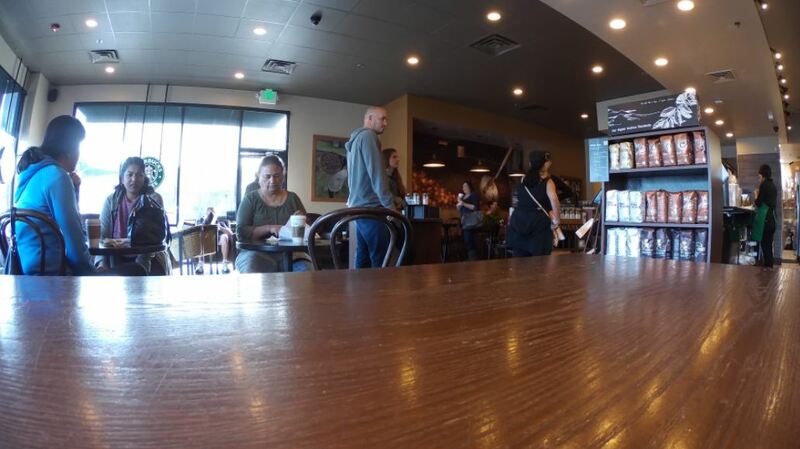 There were people sitting at tables and in the chairs drinking coffee and chatting. To my left, on the long table, was a job interview. A few people looked like they were in a meeting and a couple of people had laptops and appeared to be working. Note: My meetings there went well. The noise levels were not a problem, and, surprisingly, there is some conversational privacy afforded by the ambient noise. The furniture is nice with comfy chairs, small and medium sized tables, and the one long table that I like. Unlike coworking where you get to know people, these people are all pretty much strangers to each other and I am sure very little or no small business to small business collaboration takes place. I have been there when it was impossible to get table space except for outside (it is “winter” so the meeting was chilly). There are power outlets behind the long table and by the chairs near the windows. No printers or other “office” amenities. As measured by my noise measuring app the noise level was about 75 db or “busy traffic”. But again, it was not distracting as all the voices melded together in a cafe vibe. 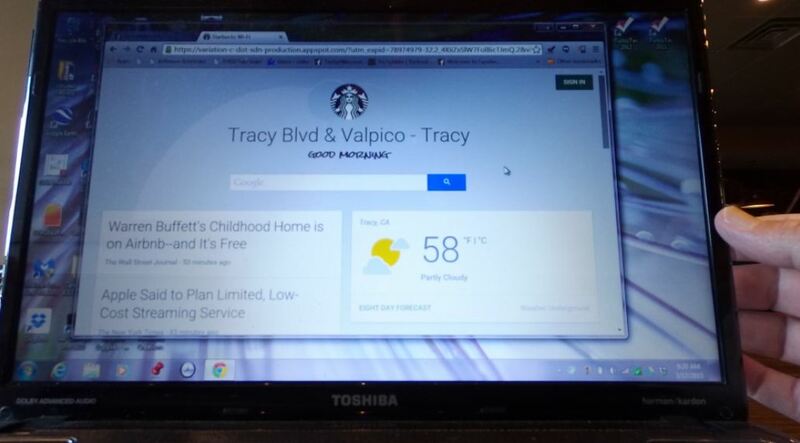 Connecting to the Google WiFi at this Starbucks is easy with both my Samsung Galaxy Note 4 and Toshiba laptop running Windows 7. Once signed in, you are taken to a landing page that I suppose is helpful to some, but, I just went to my browser and started working. Be careful connecting to an open WiFi network. Make sure it is THE WiFi for the location (and not a hacker spoofing the name), use https when browsing, make sure your firewall is on, that your computer is password protected, and do not do banking while you are there. I have had no problems being kicked off the network. But, then again, I have not stayed more than 2 hours, so you may experience a time-out for connectivity. Let me know in the comments below if you time-out. Pretty fast with a download speed of 51 Mbps and an upload speed of 11 Mbps. Certainly fast enough for applications up to, and including, HD video conferencing. I have had meetings last over 2 hours and no one asked me to leave. I have met (rather seen) people who seem to work there for long stretches at a time meeting with clients, or just working on their computers. 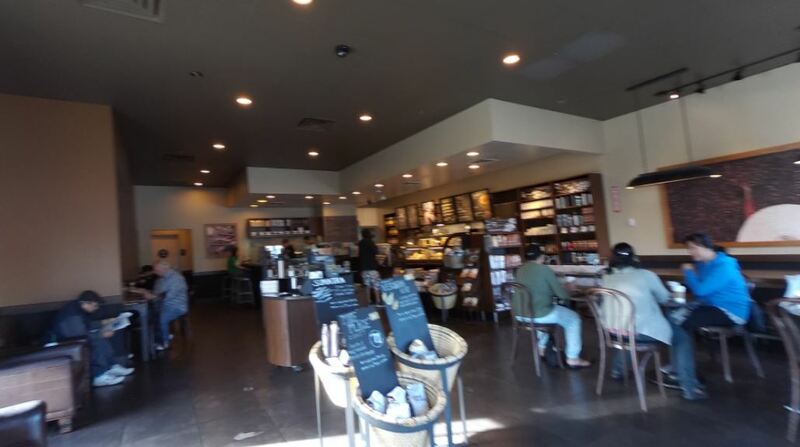 The Starbucks by Raley’s in Tracy, CA is a nice place to get some work done and meet with clients. The long table rocks. 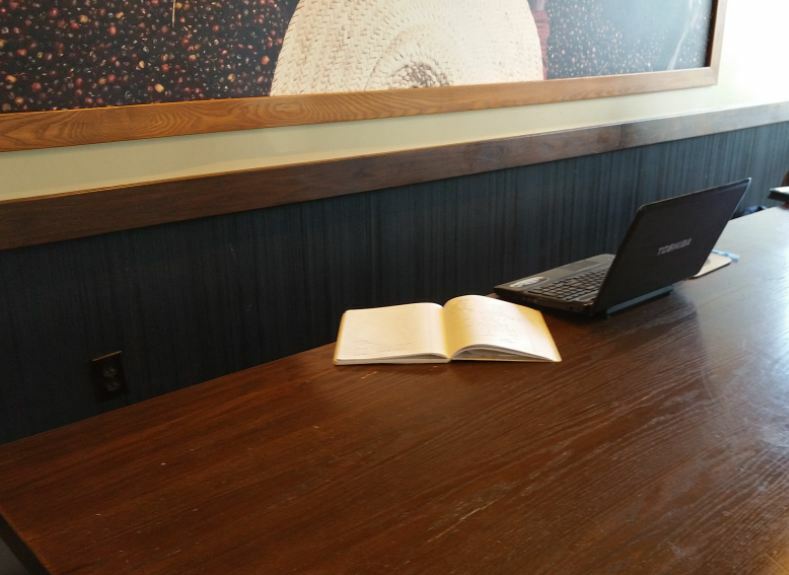 Why pay for a coworking location when Starbucks is free with almost everything you need to get the job done (and the rest: printer, paper, etc are at home)?? I need to answer that question as I continue this research. Comment below to help me out….